Follow these general instructions for removing, changing, and fastening bands, and then find the instructions for your specific band later in this section. Make sure you’re replacing a band with one of the same size. The bands are sized according to the size of Apple Watch and should not be used interchangeably. Some band styles are made for a particular size Apple Watch only. Change bands. 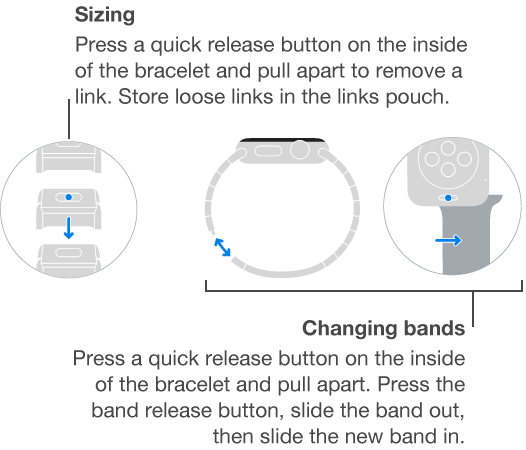 Press the band release button on Apple Watch, slide the band across to remove it, then slide the new band in. Never force a band into the slot. If you’re having trouble removing or inserting a band, press the band release button again. Fasten a band. For optimal performance, Apple Watch should fit closely on your wrist. For best results, the back of Apple Watch needs skin contact for features like wrist detection, haptic notifications, and the heart rate sensor. Wearing Apple Watch with the right fit—not too tight, not too loose, and with room for your skin to breathe—will keep you comfortable and let the sensors do their job. You may want to tighten Apple Watch for workouts, then loosen the band when you’re done. In addition, the sensors will work only when you wear Apple Watch on the top of your wrist. Materials include leather with stainless steel or 18-karat gold. Materials include leather with stainless steel; fits the 42 mm Apple Watch only; contains magnets. For information about magnets, see “Medical device interference” in Important safety information. Important: Press a quick release button first so that the Link Bracelet is in two pieces before you attempt to remove or resize it. Materials include stainless steel; contains magnets. For information about magnets, see “Medical device interference” in Important safety information. Materials include leather with stainless steel or 18-karat gold; fits the 38 mm Apple Watch only; contains magnets. For information about magnets, see “Medical device interference” in Important safety information. Materials include fluoroelastomer with stainless steel or 18-karat gold.